With Merthyr, the acknowledged top dogs of South Wales football, having been defeated 3-0 at Penydarren Park it was becoming apparent by February that the newly founded Swans had a genuine chance of capturing the Welsh FA Cup at their first attempt, as well as still challenging for promotion to Division I of the Southern League. In the semi-final Swansea Town would again play Cardiff City on February 15th. The sympathy of the local public had been recently engaged by the discovery of the tragic fate of Captain Scott’s expedition to the South Pole, including Gower man Petty Officer Edgar Evans. Although Scott and his men had died nearly a year before, news of their deaths had only just reached Britain with the return of the expedition ship “Terra Nova”. However local sporting enthusiasts would have been concentrating on the forthcoming cup tie against Cardiff City and in the South Wales Daily Post “Ajax” stated that “The interest of Swansea’s sporting public is almost entirely centred in the Swans’ semi-final engagement with Cardiff City at Ninian Park…and the rugby engagement with the Taffsiders has been absolutely obscured.” He went on to predict that “…the winners of this game can look upon the Welsh Cup as theirs.” Such interest in what has become a second tier competition may seem strange today, but the Welsh Cup had been established in 1877, being dominated by North Wales clubs until the advent of professional football in South Wales shifted the balance of power – Cardiff themselves being the first South Wales winners in the previous season. There were no equivalent Rugby competitions at the top club level until the 1970’s, and interest was such that an excursion train to carry supporters would leave Swansea High Street at 1.10 p.m. The game had been switched from the neutral venue of Penydarren Park to Ninian Park to attract a higher gate, so the Swans would effectively be playing away. The Swans then had to wait until April 19th for the final, which was again scheduled for Ninian Park against Pontypridd. Although they had narrowly missed out on promotion to Southend they would start as favourites against the Dragons who were in mid-table in Division II of the Southern League. In an uncanny echo of the shocking disaster at the Gleision Colliery in the Swansea Valley 98 years later, two miners were reported trapped underground at the Gleision mine in the Daily Post on Wednesday 16th April; but on this occasion the paper could report “Thrilling Valley Rescue – Entombed Men Saved” by the Friday. Many colliers in that period were not as lucky. In the same day’s paper the realities of professional football were emphasised by an advertisement placed by the Swans’ directors inviting applications for 5 Shilling Shares in the club to gain more capital. Apart from the cost of players’ wages, travel and so on a great deal of work still needed to be done on the Vetch Field. Disappointingly the final was an anti-climax. The score was 0-0 and after the 20,000 crowd at the semi-final only just over 8,000 turned up at Ninian Park. Apparently the 4.30 p.m. kick-off deterred many and that decision was criticised. In pre-television days the same day’s FA Cup Final between Sunderland and Aston Villa would hardly have been a major counter-attraction, though the gate of 121,000 who saw Villa’s 1-0 win may have contained a few from South Wales as excursion trains to cup-ties were very popular at the time. The Daily Post reported only briefly on the game that Monday with the Swan’s chairman quoted as saying they “should have won.” The Swans’ Welsh League game at Mardy referred to, incidentally, was not played; the ground was in such a state that the Swans refused to play. Given that the Club did not have two full teams of professionals, and that skipper Hamilton who had played on Saturday and was due to replay the Final on Thursday might have had to play, this is not entirely surprising! It does seem odd to us though that the referee was not the ultimate judge of conditions in those days. On Thursday the readers of the Daily Post were treated to an enormous front page advertisement for corsets; if they could drag themselves away from that there was a preview of the Final Replay at Mid-Rhondda F.C.’s ground in Tonypandy. Mid-Rhondda themselves were a new club, the ground having previously been used for Rugby League, and the foundation of the Association Club having been delayed by the Tonypandy Riots! Although it was a working day 500 Swans’ supporters were reported to have taken the excursion train and the kick-off was apparently late enough to accommodate local colliers coming off shift. Injuries had forced changes in the Swansea forwards and this caused some doubt about whether success could be obtained. 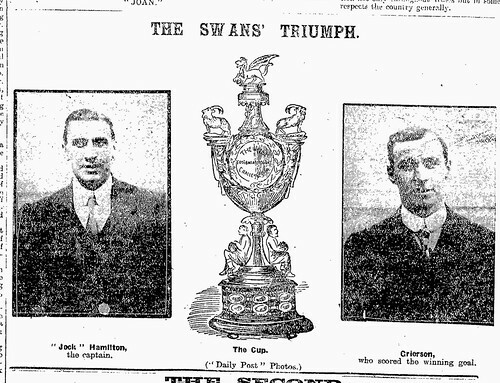 As it turned out the doubts were misplaced and on Friday the corsets were replaced on the front page of the Daily Post by the report of “Crowning Triumph: How The Swans Won The Cup: Memorable Homecoming.” “Ajax” was given plenty of space and began by describing the Swans’ return with what was already a famous trophy – crowned (as it still is today) with goats and a dragon. The crowds packed High Street, Castle Street and Wind Street as far as the New Cut Bridge and the enthusiastic supporters pulled the team’s brake (an open four wheel carriage) themselves to the Royal Hotel, dispensing with the more usual horses! As far as the game itself went, the conditions were awful. The ground was a mud heap and it was raining steadily, and the Swans had gone down 5-0 at Mardy in similar conditions. Pontypridd were stronger and adapted more quickly to the pitch, but as the game went on the Swans, like the team of 100 years later, began to get a passing game going. “Their movements would have done credit to them on the best of grounds” wrote “Ajax”, and “the ball was slung about with splendid accuracy…” Eventually right half Duffy took the ball forward and fed his winger Messer. His shot was saved; Weir could not convert the rebound but Grierson – whose fitness had been in doubt – was on hand to score from close range. The conditions told in the second half, though, and Pontypridd were well on top when they were awarded a penalty ten minutes from the end. With the crowd anticipating another half hour in the rain for extra time, though, Hall’s penalty was saved by Fisher who had replaced the player-manager Whittaker as first choice goalkeeper and he was rushed by his team mates. “Some even embraced him, whilst the crowd yelled themselves hoarse.” The Dragons were slain and the Swans had won the Welsh Cup. A long editorial also congratulated the Swans and commented on how the League structure and the principle of promotion and relegation sustained interest throughout the season, which might have been a veiled comment on amateur Rugby Union which, unlike professional rugby and soccer, refused to countenance leagues for many years. Given the dreadful weather and the late afternoon kick off it was hardly surprising that the Post had no photographs of the match, but a picture of skipper “Jock” Hamilton and scorer Grierson with the Cup in all its glory was included. Even the Western Mail had to admit that the Swans were “immeasurably the superior side”, though “Hotspur” was kinder to Weir in claiming that he had started the move leading to Grierson’s goal by passing to Messer. In the murk of a rainy Rhondda evening it must have been hard to see clearly! Incidentally, one has to feel sorry for what was apparently a “depleted” Risca side who conceded TWENTY goals to Mardy in the Welsh League on the quagmire the Swans reserves had refused to play on that Monday. After all this drama it must have been a relief to turn to the Daily Post report of a Breach of Promise of Marriage case in East London. Miss Charlotte Boyle felt that her fiancé, Richard Holdstock, who earned “two guineas a week and had an additional income as a banjo player” had neglected her in favour of the Boy Scouts organisation, then only six years old. He had apparently told her “The boy scouts come first” which presumably did not carry the connotations which it might now have! Unimpressed by her case and noting that she seemed to have made the first move to break off the engagement, the Under Sheriff awarded her a farthing (a quarter of a penny) in damages. Mr Holdstock’s passion for Miss Boyle might have cooled, but the love affair between the Swans and the local sporting public had started on much more cheerful terms. You can read the newspaper clippings here. Swansea vs Arsenal 1968, the Vetch Field’s Record Attendance.